Alice Springs day tours are a great way to explore the best of the region while leaving time on your itinerary to visit other attractions. The 4WD, luxury coach, river cruise, hot air balloon and on-foot tours visit cattle stations, national parks, rock formations, ranges, gorges, Aboriginal communities and more. Completely immerse yourself in the character, charm and landscapes of the outback with an Alice Springs camping tour that offers an authentic bush experience with camping, campfire food and sleeping under the stars. 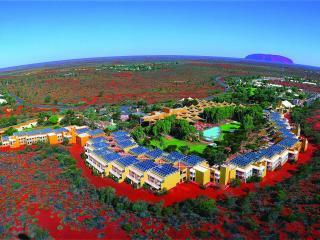 Must see stops include Ayers Rock, The Olgas, Kings Canyon, West MacDonnell Ranges and more. Spend a little more time taking in the amazing outback and enjoy a more comfortable experience with all the mod cons with an Alice Springs accommodated tour. Visit The Olgas, Ayers Rock, Walpa Gorge, West MacDonnell Ranges, Kings Canyon, Watarrka National Park and more on foot, by 4WD, coach or scenic flight.